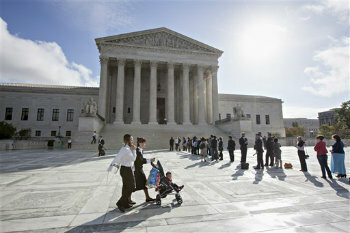 The fate of President Barack Obamas health care law is again in the hands of the U.S. Supreme Court. Oct. 30 (Bloomberg) — The fate of President Barack Obama’s health care law is again in the hands of the U.S. Supreme Court. The tax credits have implications well beyond the 4.6 million people who receive them in those states. A high court decision against the administration would have ripple effects, undercutting other parts of the Affordable Care Act and potentially destabilizing insurance markets across the nation. “The basic structure of the act would be gutted,” said Theodore Ruger, a health law professor at the University of Pennsylvania Law School. The law, intended to provide coverage to tens of millions of uninsured Americans, has been attacked by Republicans since it was passed on a party-line vote in 2010. While many provisions are popular, a majority of Americans say they disapprove of it, polls show. More than 100,000 anti-Obamacare ads have aired this year as Republicans try to exploit what they see as a Democratic liability in next month’s elections. Unlike in 2012, when the core of the statute survived on a 5-4 vote, the latest case comes to the court with the law’s major provisions in effect and more than 14 million Americans covered by its programs. Critics predicted the law would result in soaring insurance premiums and national health-care spending. So far, that hasn’t happened. Those words matter because only 14 states have set up their own marketplaces, known as exchanges. The rest have left the job to the federal government, as the law permits. The question is whether people can collect the subsidies even if they buy policies on the federal exchange. “The president did this in an attempt to make his unworkable health-care law workable,” said Michael Cannon, director of health policy studies at the Cato Institute. The libertarian organization is backed by Charles and David Koch, who have invested tens of millions of dollars opposing Obama’s policies and Democratic candidates. A Supreme Court ruling against the administration would mean that more than half of the 7.3 million people who have bought Obamacare policies aren’t entitled to the subsidies they are receiving. That would be just the start. Without the billions of dollars in tax credits, many of those people would find insurance so expensive that they would qualify for the law’s hardship exemption and no longer have to obtain a policy. The result might be that only the sickest and most desperate would get insurance through the individual market, at least in states that haven’t established their own exchanges. “We’re going to see insurance pools that are largely dominated by people with major health problems,” said Ron Pollack, executive director of Families USA and a supporter of the law. That could raise coverage costs for insurers, forcing them to raise rates and eventually sending the market into what the administration says would be a “death spiral.” Hospitals would be left to foot the bills for more uninsured patients. Political leaders in states without exchanges would probably then face new calls to set up their own marketplaces. One possibility is that a state could “establish” its own exchange and authorize the federal government to run it. For now, the question is whether the Supreme Court will take up the issue at all. In the case in front of the justices, a federal appeals court based in Richmond, Virginia, upheld the IRS regulation in July on a 3-0 vote. On the same day a federal appeals court in Washington reached the opposite conclusion, rejecting the administration’s approach in a 2-1 ruling. Although that sort of appellate division normally makes Supreme Court review likely, a larger panel of judges on the Washington court has since agreed to reconsider its case. That at least temporarily eliminated the split, easing pressure on the high court to get involved. The attorney leading the legal challenge, Michael Carvin, contends that the issue is too important for the court to wait. “Billions of taxpayer dollars are pouring out of the Treasury absent congressional authorization and millions of Americans are ordering their lives around an impugned regulation,” Carvin wrote in a court filing. Carvin, an attorney with Jones Day in Washington, also argued against the law in the 2012 case. In the latest dispute, he represents four Virginia residents who say they don’t want to buy insurance on the government-run exchange. Although the justices could reject the appeal as soon as Nov. 3, a decision accepting the case wouldn’t come until at least Nov. 10 under the court’s normal practices. The high court might not be eager to get involved, Ruger said. The justices endured a divisive clash in 2012, punctuated by reports that Chief Justice John Roberts switched sides late in the court’s deliberations to provide the decisive vote to uphold most of the law.